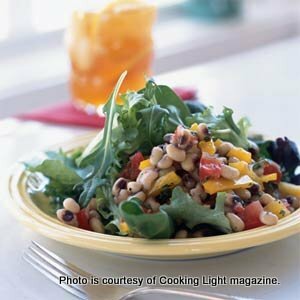 As this 15th anniversary of National Soul Food Month wraps up, here is one of my favorite salads putting black-eyed peas in the limelight. I developed this recipe for Cooking Light magazine—it makes a flavor-filled addition to summer menus. You can serve it as a side or main-dish salad. It looks good, tastes good and is good for you! NOTE: You can serve boost nutrition even more by serving over prepared brown-rice.